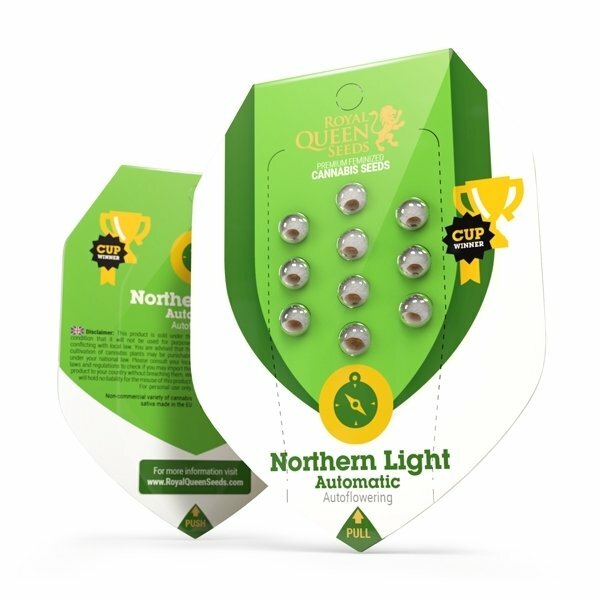 Northern Light Automatic by Royal Queen Seeds is an autoflowering cannabis hybrid of the well-known Northern Light. This weed has been created in USA in the 70’s as a combination of Afghani genes, but its true career started in Amsterdam in the early 80’s setting up the standard for growing indoor marijuana. By adding ruderalis genetics, Royal Queen Seeds breeders made it an autoflowering strain. Northern Light Automatic is a marijuana breed that reaches the records in growth gaining the 120 cm in indoor conditions. According to this fact this cannabis breed is strongly advised for any type of indoor farming but she adapts easily to warm outdoor climate. This marijuana plant is a fast grower with an average lifespan of 10 weeks from seed to harvest. Outdoors result in Spain mentioned that a result up to 200 g could be obtained. The average in proper indoor conditions will be 90 g apiece. Northern Light Automatic by Royal Queen Seeds shows the quality of the Northern Light ancients, producing the same sweet and juicy flavor. She is a perfect breed to use as curative cannabis with a soft and delicate physical high.